Painting Mediums : Painting Techniques| Oil Paintings :: How to Paint Realistic and more! By learning and understanding the many different vehicles and how they will perform, you will build a sound knowledge of their usage. It does not make sense to me to search for a medium that will do all things, such as I dry slow, dry fast, be opaque, be transparent. The artist can from the outset easily select the ingredients for his medium that will do the job for his particular painting. A reliable painting medium, if used with knowledge and used sparingly, should hold up well and cause no bad effects in the future. Once you select a particular medium for a painting, it would be bad procedure to change to another while in the process of painting. You may experience all sorts of bad effects on the paint if you do not follow this rule. [f you start your experiments with a basic medium, such as one-third turpentine, one-third linseed oil and one-third dammar varnish, you will have I a good point of departure. If you want to slow the drying time, decrease the amount of varnish. To increase the drying time, add turp or varnish. There is a point beyond which too much varnish will make the paint sticky and hard to handle. Also if you use too much oil, the paint will become and hard to handle. Also if you use too much oil, the paint will become disagreeably greasy and have a poor drying rate. No amount of words will put together a medium that will give you just what you desire. The following checklist should allow you to select media I for the particular quality you personally desire in your finished painting. Any addition of turpentine or petroleum distillates will hasten this drying I time. Resin ethereal varnishes-damar or mastic-will give the medium the desired depth of luminosity and transparency. If used in excess, these become disagreeably sticky and hard to handle. The drying time under normal conditions is one to two days. Balsams-Canada balsams, Venice turpentine, etc.-lend a smooth effect to the paint surface. They combine well for a glaze medium and, if not used to excess, dry in two to three days. The effect of blending one color into the next can be obtained with the use of the balsams-no other medium will produce it so well, especially in conjunction with the thickened oils. Sun-thickened linseed oil gives the paint surface an elastic enamel-like quality. It dries rather fast when mixed with turpentine, allows for a fluid I draftsman like application. The same may be said for stand oil, except that it has a slower drying rate. Linseed and poppy oil are the basic vehicles used today in the grinding of tubed paints. Linseed oil gives the painting a hard surface and, if used in excess, tends to yellow considerably and to wrinkle. Poppy oil will yellow less but, if too much is used, and if painted in layers, wet over dry, will I crack. 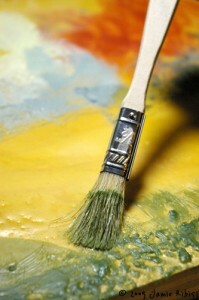 Poppy oil is best suited to painting that is to be finished wet-in-wet. It possesses a good buttery quality and feels good on the brush. The drying I time of these vehicles is influenced by a number of things, such as the absorbency of the ground, heat and cold, and humidity. You will also find that the size of the canvas enters into it. On a canvas 4 feet by 8 feet, the medium and its requirements are totally different from a small 12 by 16 inch canvas. We could sum up by saying that there are so many intangibles and personal preferences that you must, with experimentation and experience, build the medium that suits you best.